In a striking departure from the original design, Audemars Piguet just unveiled the Royal Oak Offshore Tourbillon Chronograph, in an aggressive restyling for the 25th anniversary of its iconic oversized sports watch. Excepting the Royal Oak Concept of 2002, the 25th anniversary Offshore is arguably the most radical reimagining of the octagonal design to date. Slated to mark its birthday next year, the Royal Oak Offshore was introduced in 1993, itself a commemorative model meant to mark the 20th anniversary of the Royal Oak. Designed by a Emmanuel Gueit, now an independent designer whose greatest triumph was the Offshore, the watch was a beefed up, 42mm version of the slim, original Royal Oak, making it almost abnormally large for the era. While it was met with criticism from the industry – Royal Oak designer Gerald Genta reputedly disliked it – the Offshore grew to become one of the most influential watches in contemporary watchmaking, surpassing the Royal Oak in pop cultural significance. In the early to mid 2000s the Offshore was arguably the hottest watch of the era, acquiring a cult status among celebrities and athletes, especially in the United States, with over 120 iterations and special limited editions, including versions dedicated to Jay-Z, Arnold Schwarzenegger and LeBron James. The Offshore undergone slight tweaks over the years – once in 2006 and again in 2014 – but never to the extent undertaken with the new Royal Oak Offshore Tourbillon Chronograph. Slated for an official launch at SIHH 2018, it is both edgy and open-worked, gaining a menacing profile thanks to an entirely redesigned dial, movement and bezel. While the complications and movement are based on an existing model (the refs. 26388PO & 26288OR), the anniversary model is defined by a new bezel. The famous octagonal bezel was slimmed down and hollowed out around the exposed screw heads (which are actually nuts as Royal Oak fans will know). In turn, the dial has been reduced to a series of eight skeletonised bridges that are secured by the eight nuts. 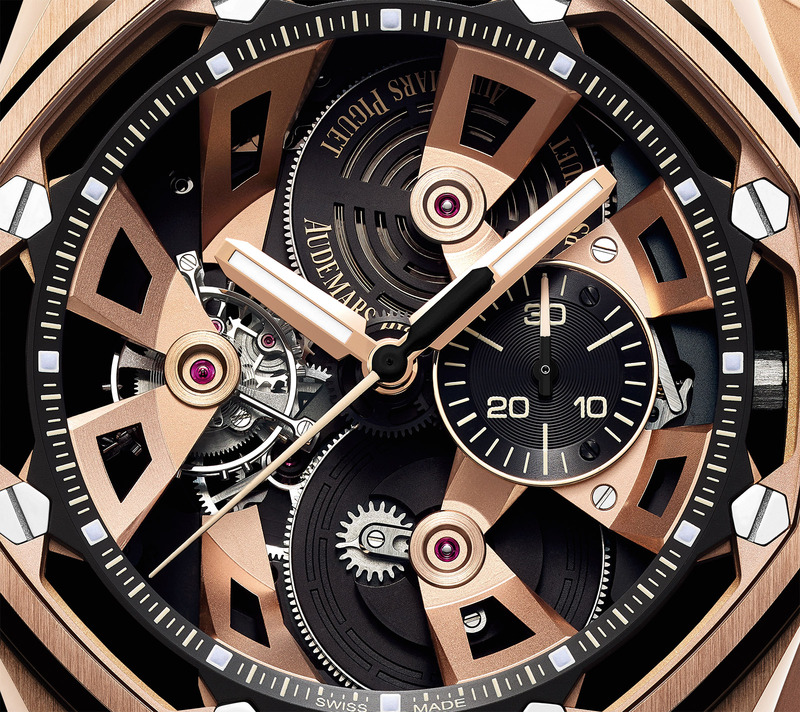 Four of the largest bridges secure each of the twin barrels, as well as the tourbillon. While the case has retained its signature style, subtle changes have given it a more athletic profile. The bevels on the flanks of the lugs are wider and more pronounced, for instance. It measures 45mm in diameter, and is available in both stainless steel and pink gold. And as with the second generation Offshore chronograph, the crown and pushpieces are now in black ceramic instead of rubber-coated metal. 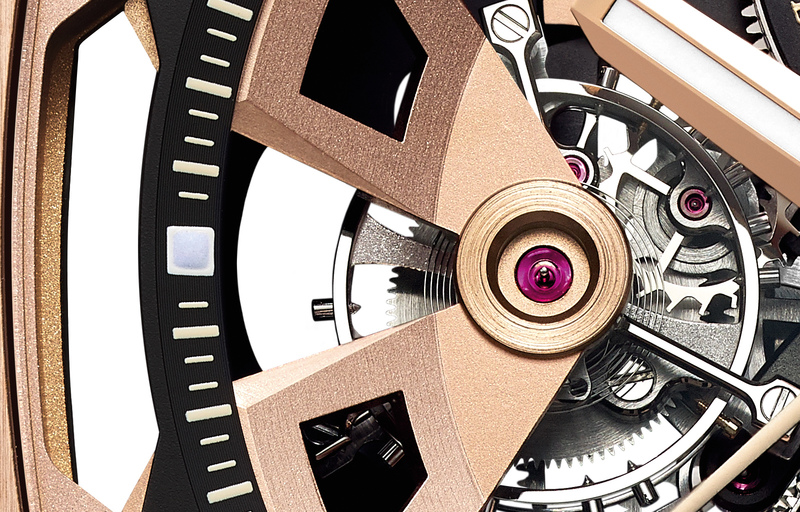 On the steel model the pushpiece guards are titanium, while while the gold version they are in pink gold. While the cal. 2947 movement inside is new, it is a variant of the existing cal. 2933. It is hand-wound, with both an integrated column wheel chronograph and tourbillon regulator, as well as double barrels that offer a seven-day power reserve. 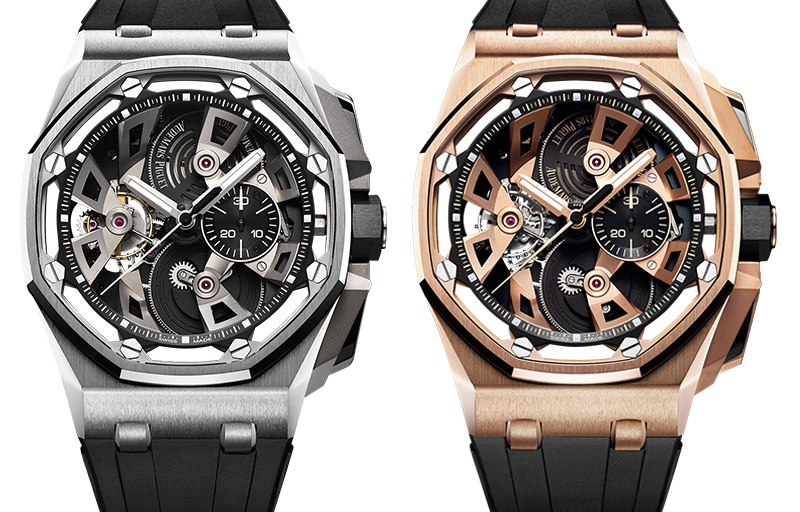 Limited to 50 pieces each, Royal Oak Offshore Tourbillon Chronograph in stainless steel (ref. 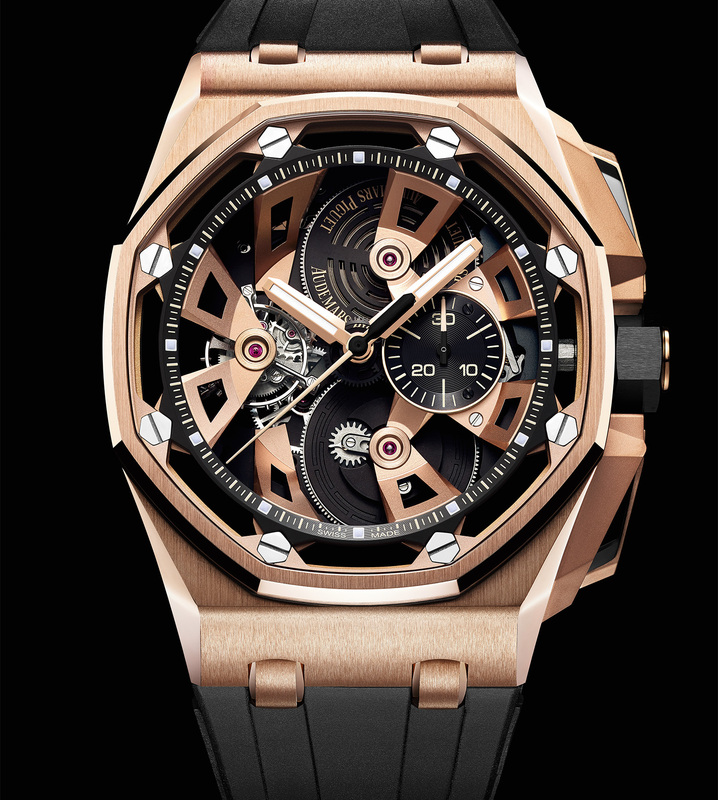 26421ST.OO.A002CA.01) is priced at SFr275,000 and the pink gold (ref. 26421OR.OO.A002CA.01) at SFr310,000; prices exclude taxes.